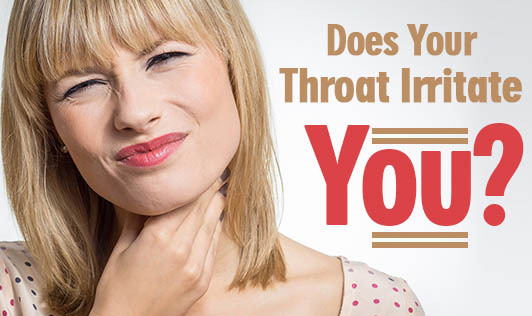 Does Your Throat Irritate You? Throat irritation is one of the common problems that most people face. It can be an itchy feeling or it can feel like as though something is stuck in your throat or just a dry cough. Throat irritation can be caused by an allergy or an inflammation of the throat region - voice box or wind pipe or back of the throat. Dry weather can also lead to a scratchy feeling, particularly in the morning. Environmental pollution, smoking, alcohol, spicy foods, acid reflux are other possible causes. Most of the time, throat irritation goes away on its own when the irritant is removed. Gargling with warm water helps to ease the discomfort. If there is bacterial infection, medication will solve the problem. Cough drops help to keep the throat moist which helps some people. It's important to give the throat some rest by talking less when there's irritation. If the irritation persists consult your doctor.